Please read below to learn more about health issues which are currently of concern in our school district. We will be holding a flu clinic for the students of Belchertown Public Schools. It will be held October 28th from 3:00-5:00 pm in the BHS cafeteria. Students from Belchertown High School and Jabish Brook are asked to come between 3:00 and 4:00, students from Cold Spring School, Swift River Elementary, and Chestnut Hill Community School are asked to come between 4:00 and 5:00. Please note that a parent or guardian must accompany their child regardless of age. Please print and fill out the parent permission form and read the Flu 2014 Vaccine Information Statement prior to the flu clinic. Please also have your child wear a short sleeve shirt for their convenience. As you are likely aware, the United States has been experiencing a nationwide outbreak of enterovirus D69 (EV-D68) associated with severe respiratory illness that has been especially harmful to children. To address this public health concern, the U.S. Department of Education and our federal health partners have a number of informational resources to share with you. Almost all of the Centers for Disease Control and Prevention (CDC)-confirmed cases this year of EV-D68 infection have been among children. Many of the children had asthma or a history of wheezing. Many parents continue to be worried about the outbreak and want information about what they can do to prevent illness and protect themselves and their families. The CDC has developed information and resources for parents about EV-D68. 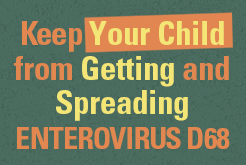 Remember too, as enterovirus season is expected to taper off, flu activity usually begins to increase in October. While there is not a vaccine to prevent illness from enteroviruses, the single best way to protect against the flu is to get vaccinated each year. Many resources for parents and others can be found on the CDC flu website. CDC recommends that ALL children 6 months old or older get a flu vaccine.